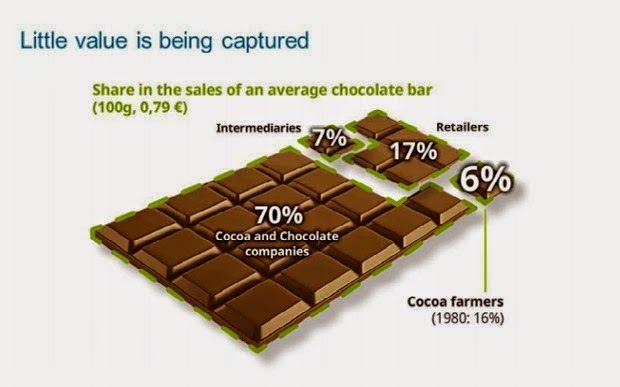 The picture shows the disproportion among the gains received by cocoa producers and the revenues of chocolate manufacturers. A market which operates on the basis of very low prices for cocoa, puts at risk the sustainability of cocoa growing. Market information systems. Unlike many other crops, growers are able to store mature cocoa beans for up to a month. As a result, the grower does not necessarily have to sell to the first potential buyer. However, small farmers in remote areas of the Cote d'lvoire find themselves at a disadvantage compared with other growers. Because of their remote location they will have fewer opportunities available to them. They usually do not have Internet access and often lack key market information. The chocolate industry is providing data on current market prices to growers through Field Training Officers, and via newsletters. Armed with this data, together with advice and training, the grower is better placed to negotiate a fair trading price. Research. When cocoa growers produce a better yield of high quality cocoa beans, everyone benefits. The chocolate industry funds research into improving agricultural techniques and approaches. This has provided treatments for cocoa plant pests and diseases such as the Cocoa Pod Borer. Without support, farming families can lose well over a third of their crops each year from disease and pests. Training. The industry also funds a range of Field Schools for cocoa growers in Africa. These schools show farmers how to improve their production methods. This includes pruning dead cocoa pods; weeding around plants; planting suitable native trees alongside their cocoa. The schools cover other vital aspects too e.g. business management techniques; fair and proper treatment of workers. Tourism is one of the world industries not affected by crisis. According to the latest UNWTO World Tourism Barometer, international tourist arrivals reached 1,138 million in 2014, a 4.7% increase over the previous year. For 2015, UNWTO forecasts international tourism to grow by 3% to 4%, further contributing to the global economic recovery.